Ski the classic route from Chamonix to Zermatt. Hut to hut in the European Alps. Exciting terrain, fantastic scenery, comfortable huts with excellent food and drinks. The ski trip of a lifetime. 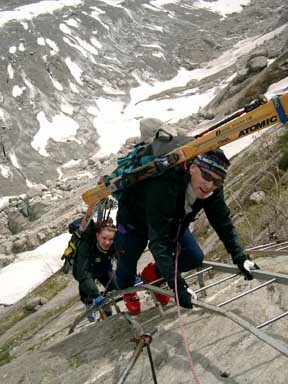 Optional ski ascent of Mont Blanc. Price includes all accommodation, meals except in Chamonix and Zermatt, hut fees, cable cars and ground transport, and guide fees. Flights to Europe are at low season rates. The most famous ski tour in the world! From the French mountain resort of Chamonix our route takes us along the crest of the Pennine Alps to Zermatt in Switzerland. En-route you pass by some of Europe’s largest peaks and glaciers. With its challenging passes, glacier descents, high mountain huts and international popularity this tour has a unique ambiance and character. The tour begins in Argentiere, 5km up valley from Chamonix. The cable car to the Grands Montets gives us a good start and tourers ski down to the Argentiere Glacier. From there the route ascends to the spectacular Col du Chardonnet (3323m) which leads to the Saleina Gl., the Plateau du Trient (Trient Hut). Then the Col des Ecandies (2796m) leads to the descent into the Val d’Arpette (now we’re in Switzerland) where a shuttle takes us to Bourg St. Pierre near the St. Bernard Pass. Next morning we climb to the Valsorey Hut (3030m). On past the Grand Combin (4314m) to cross the Col de Sonadan (3504m) before dropping into the Val des Bagnes where the Chanrion Hut is located.The Gl. d’Otema leads us high above the village of Arolla to the Vignettes Hut. A second route possibility is to take the shuttle to Verbier rather than Bourg St. Pierre and then cable car to the Mont Fort hut. From here we tour over the Rosablanche, past the Grand Dixence dam to the Dix hut. The next day takes us over the Pigne D’Arolla to the Vignette Hut. From here a big day with three passes takes us past the Matterhorn and down into Zermatt. Once here, we can continue on to Saas Fee or ascend the Breithorn and ski the Schwartz Glacier for an exciting finale to the trip. You will be provided with a complete equipment list on booking. All group equipment and safety gear will be provided by the guide. This trip can be accomplished on telemark skis, randonne’ skis, or split snowboards. 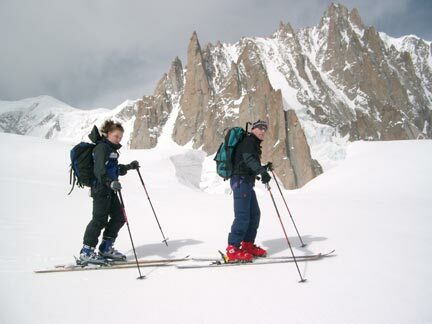 Good quality equipment is available for rent in Chamonix for a reasonable price. Early reservations are recommended on this popular ski tour. To hold a space we require a deposit of $1000 Cdn with the balance payable 28 days prior to the start of the trip. © 2019 Mountain Adventure. All Rights Reserved.